One of the great things about the NYC subway is that you can get to see some great dancers and musicians perform both on the platforms and some times in the moving trains. 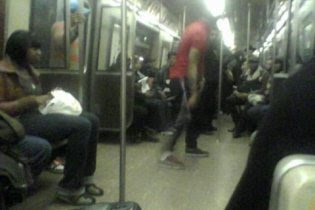 The A line subway train is particularly good for spotting such random performances as it runs non stop between 59th street and 125th street giving the performers a good chunk of time to show their act. Just a day or two ago i saw this bunch of young kids do some amazing stuff --- pretty cool - the pictures from a very basic samsung camera dont really do much justice but i hope you get the vibe and feel of the energy!